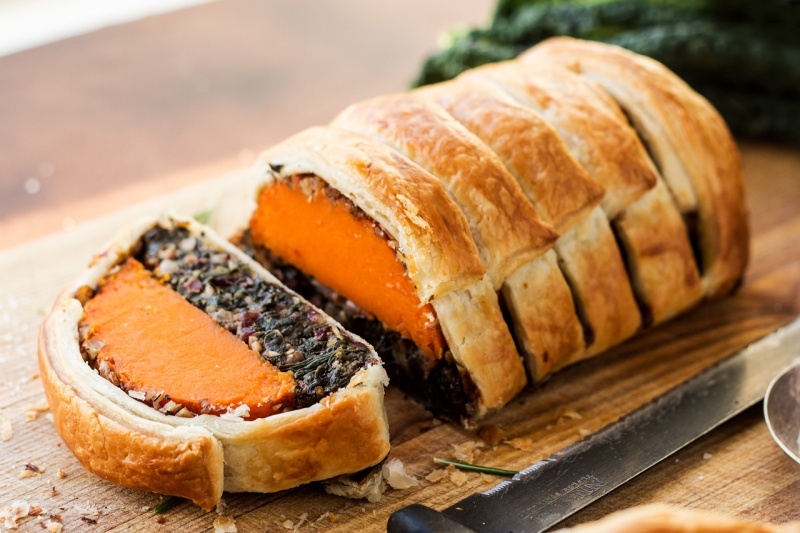 As promised, today I’m bringing in the big guns – a Xmas centrepiece of butternut squash Wellington that I’m hoping you will be inspired to try out next week. 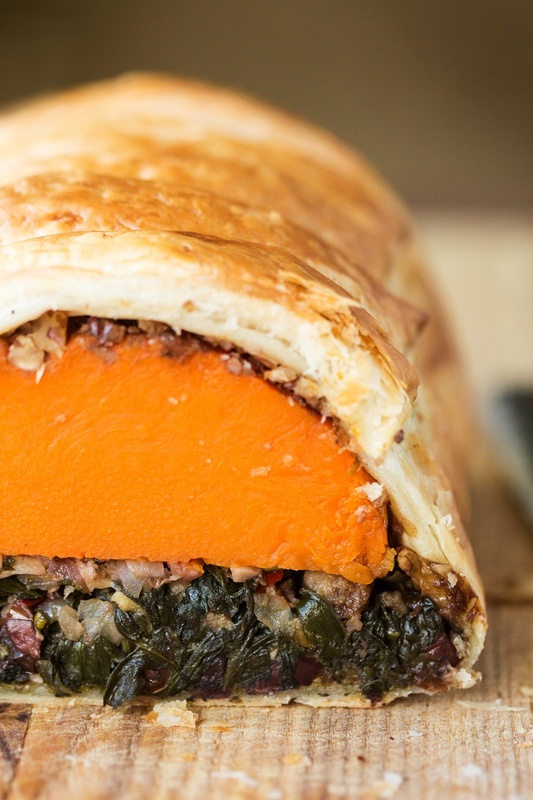 The concept isn’t dissimilar to my last year’s Beet Wellington, but it features a different star vegetable and a completely different filling. 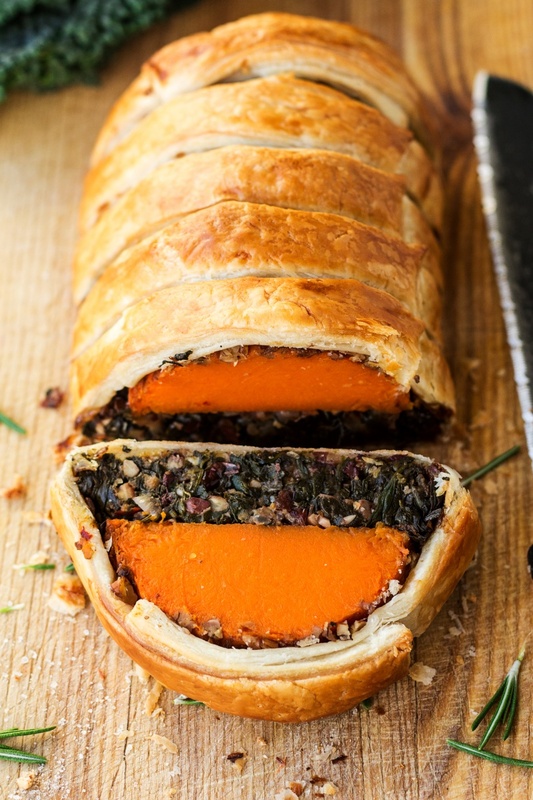 Roasted butternut squash is one of my favourite vegetables so I’ve decided it’s high time to incorporate it into a festive menu, especially that it’s elongated shape lends itself quite well to being wrapped up in pastry. 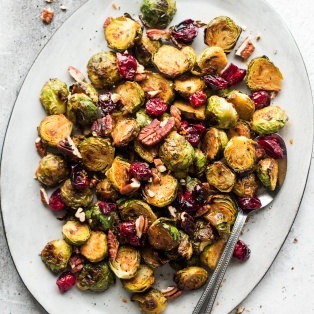 Its sweet flavour sings against the sour notes of balsamic glaze and a simple vegan stuffing made up of crunchy pecans, sour cranberries, salty olives, sage, rosemary and spinach. 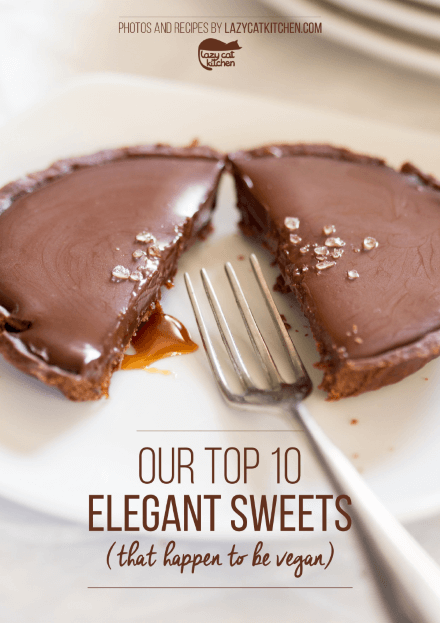 While this centrepiece may look impressive, it is really quite straightforward to make. We are bringing it with us to Duncan’s counsin’s Xmas dinner next week and I bet there will be meat eaters making eyes at it as it looks a picture. It’s the beauty of golden brown puff pastry, isn’t it? This time I went for a braid as not only does it look pretty, but it also does a better job of holding a slightly unevenly shaped filling tightly in place. 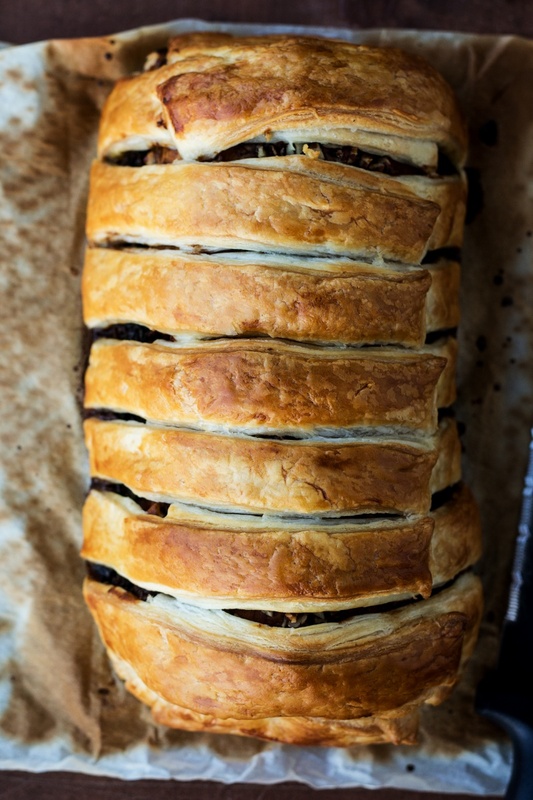 Additionally, braiding gives you plenty of natural gaps in the pastry, which means the steam created during cooking has somewhere to escape and you don’t have to worry about your pastry bursting or tearing as the Wellington bakes. Forgive me the lack of process photos, but I’m still struggling a bit with adjusting to a completely different light. Plus the lack of a decent tripod (which is part of our now very delayed shipment from Greece) or my usual props slow me down even more and that’s not a magical combination when the black clouds are never too far away. Changes, eh? Who said it was going to be easy, Ania!? PS: If you make my vegan squash Wellington, don’t forget to tag me on Instagram as @lazycatkitchen and use the #lazycatkitchen hashtag. I love seeing your takes on my recipes! 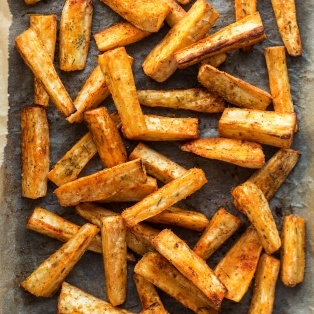 Heat up the oven to 200° C / 390° F (180° C / 355° F fan) and line a baking tray with a piece of baking paper. Cut off the bulbous part of your butternut squash (save it for another use), peel the solid part and cut it in half lengthwise. Brush the two halves with a bit of olive oil on both sides and bake in the pre-heated oven for about 25-35 minutes (depending on size), until almost cooked all the way through. Let the two halves cool down completely. Heat up 2 tbsp of oil in a heavy bottomed pan. Add finely diced onion and fry on a low-medium heat until gently caramelised. Add chopped garlic, stir-fry until softened and fragrant. Add chopped herbs and stir-fry for about another minute. Add in chopped spinach, cranberries, olives and 50 g / ½ cup of pecans and, if the pan is too dry, perhaps a splash of water (or veggie stock or vegan wine). Allow the spinach to wilt into the pan. Season with salt, pepper and chilli. Once the spinach has wilted, allow all the water to cook out completely. Cool the mixture off. Once cool, stir 45 g / ½ cup breadcrumbs through the mixture so that they soak up any excess moisture. Place the sheet of pastry in front of you so that the longer edge runs parallel to the work bench (I used a Jus Roll puff pastry sheet, which measures 23 cm / 9″ by 35 cm / 13.5″ cm). You will place your filling in the horizontal middle of the pastry. The width of the area designated for the filling is determined by the width of your butternut squash (mine was 8 cm / 3″ wide). Sprinkle the remainder of the breadcrumbs over the area where the filling will be placed making sure you leave about 2 cm / 1 ” margin at the top an bottom. The breadcrumbs will prevent the bottom of the Wellington from getting soggy. Next pile the spinach filling over the breadcrumbs, into a well compressed, rectangular parcel (you may end up with some leftover mixture). 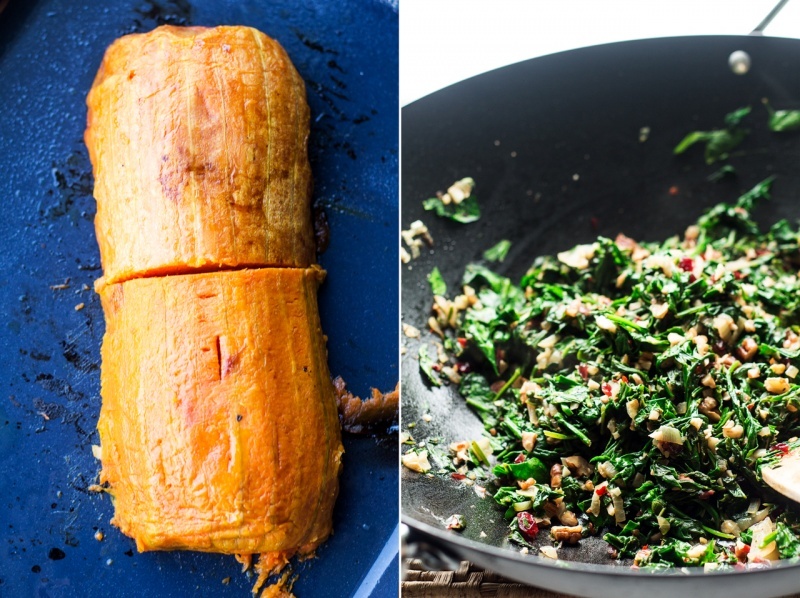 Place the two halves of the butternut squash on top of the spinach parcel so that the cut ends touch each other in the centre. Brush the cut ends with a bit of balsamic glaze to ‘glue’ the two pieces together. Glaze the top and sides of the butternut squash halves with balsamic glaze and then sprinkle them with the rest of the chopped pecans – the nuts will create a barrier stopping the pastry from getting soggy. Once the filling is in place, make a series of 2.5 cm / 1″ incisions in the pastry on both sides of the stack to be able to create a braid at the top. You can make the incisions perpendicular to the log (like I did in mine) or at a slight diagonal angle, it’s up to you. Fold both end (top and bottom) flaps up, like you would wrap a present and then braid the strips over the top of the filling, alternating sides. If you end up with big gaps at either of the ends, patch them up with leftover pastry. This method works great here as it prevents slack in the pastry and allows for tight wrapping despite the slightly irregular shape of the filling. The tiny gaps in between the braids allow the steam to escape and prevent the Wellington from bursting while in the oven. Brush the pastry with soy milk. Bake for about 50 minutes, until the pastry is beautifully puffed and golden. 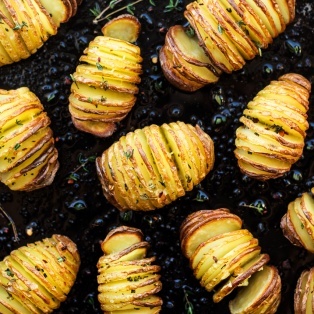 Serve with your favourite side dishes (like hasselback potatoes, for example) drizzled with the balsamic reduction you made earlier. *When choosing a butternut squash, bear in mind the dimensions of your pastry sheet. Mine was 23 cm / 9″ wide so I needed a filling that does not exceed 19 cm / 7.5 ” so that there is sufficient pastry margin left at both ends. You can either use the solid part (i.e. cut off bulbous part where the seeds are) of a very long squash or two solid halves of a short one ‘glued’ together by balsamic vinegar (although that’s not necessary) like I did here. **I know that Jus-Rol and Pepperidge Farm are definitely vegan and that Dufour definitely isn’t. If in doubt, check the packet for more details. That Wellington is so beautiful! 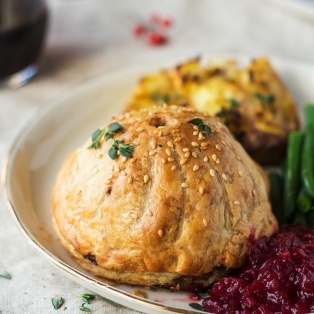 If you were to make either of your Wellington’s for dinner for the first time, which would you prefer – the squash or beet version? My family enjoys both veg so not sure which to pick?? Would it be possible to make this but not bake till the next day? Or would you recommend making and baking on the same day and then just re-heating? Thanks for this fantastic recipe. It was delicious and very easy to make. Great recipe. 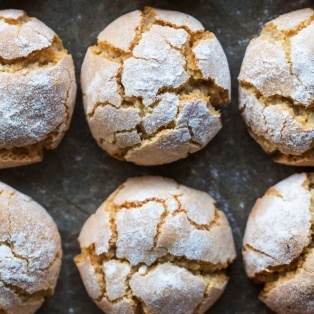 Easy to make and delicious and very festive. 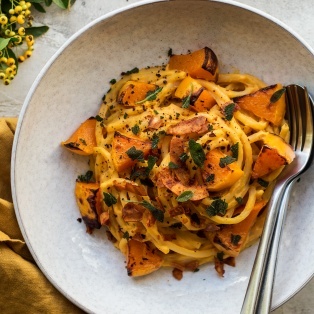 This recipe looks great and I can’t wait to try it! Can you advise a replacement for the balsamic reduction? I want to make this for my Grandmother but she is diabetic, so this would be too much sugar for her. Would this be suitable to make and cook ahead and then freeze for he big day?